I have such a backlog of recipes & reviews to put up on this blog and I am just not getting the time to do it all. It's Ramadan and even though we technically have to work shorter hours, there's just so much to do - managing office work & house chores & taking out as much time as possible for prayers & spiritual reflection. This time, I am just going to proceed with the recipe directly - no introductions :). More time for that after Eid inshAllah! Heat the oil in a karhai/wok/deep pan once the onion rings preparation has been completed and you are ready to fry. Separate the onion slices into rings, and set aside. In a small bowl, stir together the flour, baking powder, salt & spices. Dip the onion slices into the flour mixture until they are all coated; set aside. Whisk the egg and milk into the flour mixture using a fork or whisk. Spread the bread crumbs in a large plate or tray. Create an assembly line with one container holding the onion rings, the second containing the flour batter, with the breadcrumbs in a plate/tray. Dip the floured rings into the batter to coat, hold them up so that the batter can drip away. 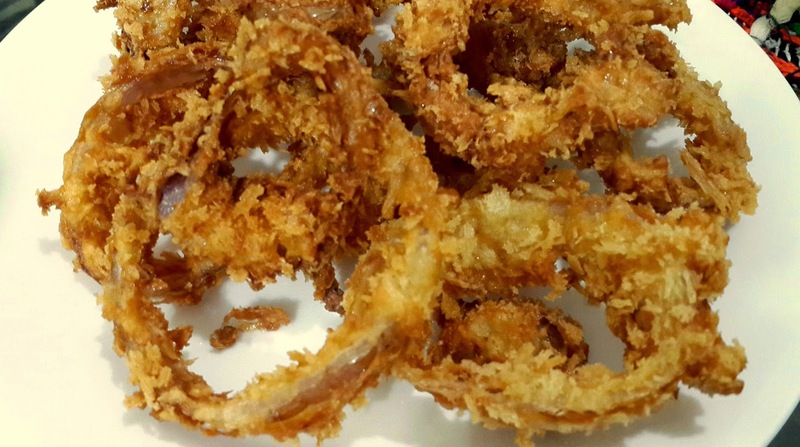 I was in a hurry so I just added all the onion rings to the batter, covered it with a big plate and then shook so that it can mix properly. Place rings one at a time into the crumbs, and scoop the crumbs up over the ring to coat. Give it a hard tap as you remove it from the crumbs. The coating should cling very well. Repeat with remaining rings. Deep fry the rings a few at a time for 2 to 3 minutes, or until golden brown. Remove to paper towels to drain. Season with salt, and serve with Chilli Mayo dip. Note: In order to avoid the dipping & coating mess, make the batter (flour + egg + milk) in ziplock bag. Once properly mixed, add the onion rings, close the bag and shake to coat properly. Add the bread crumbs in another ziplock and add the batter coated onion rings a few at a time shaking to coat again. Mix 4 tbsp mayonnaise, 2 tsp chilli garlic sauce, 1/2 tsp salt, 1/2 tsp red chilli flakes and 1/2 tsp garlic powder. Taste & adjust if required. Serve with onion rings, or french fries.